You have a current sensor that does not store value between usage. 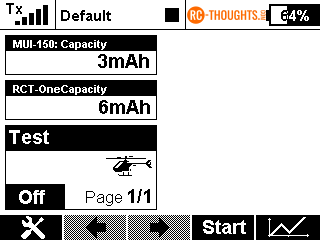 You use the same battery for several rounds of usage, this is especially often done with RX-battery. How do you keep track on capacity? 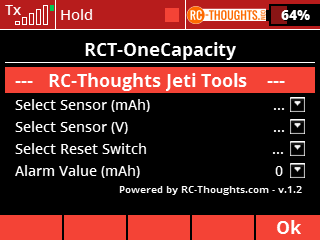 Some current sensors can keep track on that but then there is a reset-issue, how do you reset the value? Following voltage is not that accurate either. You could do without clearing values from screen after flight and write down the used value per flight. But isn’t that a bit 70’s? Let’s do it with Lua instead! Available for DC/DS-14/16/24, requires firmware 4.22 or higher. App does not run with older firmware. Sensor select is self-explanatory, so is reset switch (Usage is momentarily). Alarm value has a double function. If left to zero alarm-function is disabled. Alarm value is the total value of capacity used where you want the Lua control to activate. For example if we have a 5000mAh battery and want alarm when 20% is left then the value here should be 4000. Value is 0% (OFF) when no alarm is active and 100% (ON) when you have used capacity over your alarm threshold. Now we can do as many flights as we want, we can change model in transmitter, we can turn off transmitter and the OneCapacity will still show the total capacity used. If you are using voltage sensor total capacity is reset when new battery voltage is 2% higher than in previous use. If no voltage sensor is selected in app then automatic reset is not in use. 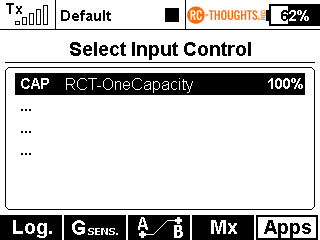 In order to reset OneCapacity to zero, power of your model and activate reset switch momentarily. Simple as that. In order to reset OneCapacity to the current value of capacity sensor displayed keep model powered on and activate reset switch momentarily.